The difference between fresh mayonnaise and that horrible jarred stuff is amazing. Health wise the difference is just as profound. The oil in most commercial mayonnaises is either soy oil (Hellman’s and Miracle Whip) or canola oil. Neither oil is safe for human consumption, both are highly toxic. And OMG the taste difference! There is no comparison! So how many egg yolks do you think Hellman’s mayo has in it? The yolk, along with a great fruity olive oil is where all the flavor and nutrition comes from! If you have a blender or food processor you can make mayo in about 3 minutes. But it is easy to over whip it and the mayo will break. If you have a whisk you can do the same with a little arm workout at the same time…my best time is just under a minute. This is from the Culinary Institute of America’s Cookbook; A little water physically broadens the space between fat droplets, helping them stay separate, If the oil droplets don’t stay distinct from one another and evenly dispersed in the oil, the mayonnaise will break. Lemon juice and vinegar accomplish the same thing, but if you add too much you run the risk of ending up with mayo that is too tart. A dollop of mustard can help create and hold an emulsion, too, which, beyond flavor, is why many mayonnaise recipes call for it. Adding water also heightens the fluffy factor. 1) Using a whisk (my recommendation) or a blender on LOW setting break 5 egg yolks into a bowl or the blender. Add salt and pepper, mustard, lemon juice, vinegar and water. 2) Either whisking or in blender; SLOWLY pour olive oil in a steady stream directly into the middle of the yolk mixture. If you are whisking by hand either use a heavy bowl or sit a wet dish cloth under it to keep it from moving. Roasted Garlic Mayo– Same recipe as above but add 4 cloves of roasted garlic. Pesto Mayonnaise – Same recipe as above but add one cup fresh basil and roasted garlic. Combine all the ingredients in a blender and let it run. Adjust seasonings to your taste. MMMM, I am going to have to make this! One question–what would be the shelf life on something like this? I have been making my own ranch dressing and they say about 2 weeks. What would you say for this? 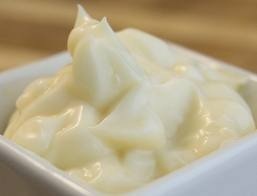 The acidity in the mayo from the lemon juice or vinegar cooks they mayo, much like seviche. I keep it about a week. You can see when it starts to go off, little bubbles start to form and it smells “off”.